Review: Cousin Kate by Georgette Heyer. 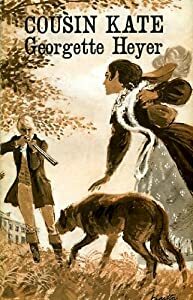 The plot of this book seems to be a cross between Mansfield Park and Pride and Prejudice by J. Austen with a dash of “Vanity Fair” by William Makepeace Thackeray. Kate Malvern, the main heroine, is a daughter of a British officer, Major Malvern. She was born and brought up on the Iberian Peninsula during Napoleonic wars, ‘following the drum’. At the beginning of the novel she finds herself in dire straits although not for the first time in her life. Her mother died when she was only twelve, her father was a victim of an accident not long ago and, being a gamester, he left his daughter a few trinkets and significantly more debts. After his death Kate was obliged to earn her living – not an easy task for a Regency period woman without any training. She was lucky to find a place as a governess but her luck didn’t hold too long – after the brother of her employer had proposed marriage and met with a refusal, she was fired. Now she is looking for a new ‘situation’ staying meanwhile with her former nurse, Sarah, now Mrs Nidd, whose husband owns a small inn in London. Kate doesn’t lack brains, she is quite pretty and enterprising to boot, but these factors are actually hindrances in the career of a governess – rich families are afraid of pretty scheming women who might try to ensnare any eligible bachelor among their lot. Sarah, seeing that her beloved Miss Kate becomes quite desperate and wants to find any job, even as an ‘abigail’ (i.e. maid), decides to take matters into her able hands and write to the closest living relative of late Major Malvern – his younger sister, Minevra Broome of Staplewood. The letter, written without the knowledge of ambitious Kate who had opposed such a plan, achieved fantastic effects. Short afterwards Lady Broome presented herself personally in London, talked with her niece and proud Sarah, expressing the kindest concern when it came to the fate of her late brother’s only child, and invited Kate to Staplewood for the summer. It was an offer no impoverished orphan could refuse. What’s more, Minerva almost immediately started showering Kate with presents, repeating that she had always wanted to have a daughter. Soon enough her niece feels very much indebted to her – being a honourable girl she is determined to show her gratitude when the occasion demands it. However, she can’t even guess what she might be asked to do. After all her aunt, being such a rich lady, can’t possibly want anything from a penniless orphaned girl of twenty-four? Staplewood is a great manor with a splendid park but the family which lives there is not especially happy. Sir Timothy Broome, the husband of Minevra, is a kind gentleman but rather feeble and their only son, Torquil, a very handsome boy of nineteen, is prone to sudden swings in mood and difficult to manage. Soon enough Kate meets another cousin, Philip Broome, who doesn’t like her aunt and seems to think ill of Kate too. Torquil enjoys her company very much but in a peculiar manner – once he even tries to strangle her for ‘fun’. Overall Kate feels rather let down. Although she doesn’t have to worry where to find money for food and shelter she lacks company and entertainment. There’s no busy social life going on in Staplewood – no dances or parties, even family dinners are a bit too formal. In the meantime Kate’s aunt very indirectly tries to sound her niece out: what would she say if anybody offered her the undeniably lucrative ‘position’ of the future Lady Broome…the reason of Minerva’s uncommon generosity is going to surprise Kate in a very negative way. Certainly the main heroine was likeable enough as she was given plenty of Lizzie Bennett’s traits (from “Pride and Prejudice”). The narration was well-paced so I found myself riveted to the book very soon; in fact I finished it in one day! Apart from that the sense of period is superb indeed, especially when it comes to the language of lower classes. Mr. Nidd Senior is a treat every time he opens his mouth, Sarah too! Don’t expect the plot to surprise you – this book does sound a bit schematic, especially if you read any other Heyer romances. I also found it strange that after a week of very casual acquaintance any sensible man might feel obliged to propose to a girl…especially a dowryless girl. I am not especially fond of such rapturously romantic gentlemen but perhaps, being a woman who lives in the twenty-first century, I am somewhat spoiled. A nice, light, entertaining novel but nothing more – I can recommend it to any Austen fan, especially as a summer reading. I am curious about other books of this author – are they are similar? This entry was posted in book review and tagged Georgette Heyer. Bookmark the permalink. 6 Responses to Review: Cousin Kate by Georgette Heyer. I think this is one of the books on the tour. I am glad to know that and glad you introduced me to this author, Brooke – it was not bad, not bad at all! I'm glad you liked it, anachronist, I'm not familiar with Heyer at all and wondered what her books were like – thanks for the review. You are welcome Tracy, thanks for commenting! It does sound interesting. Of course like any novel of the period, it can only end in one way – with the heroine getting married. She gets married no problem, the Red Witch! After all it used to be the purpose of any woman's life!